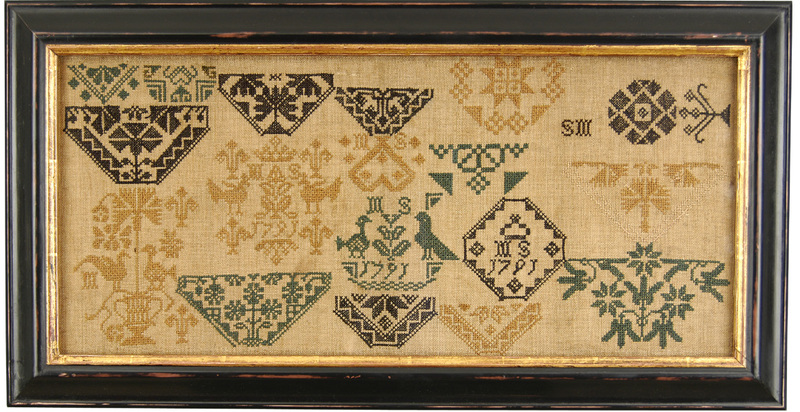 An attractive sampler worked in coloured silks contained within a strawberry border. Amongst the familiar potted plants, topiary trees, small birds etc are the biblical figures of the Spies from Canaan and Adam and Eve. Mary's name is placed in a bold central cartouche. Framed size: 21 x 17 in. 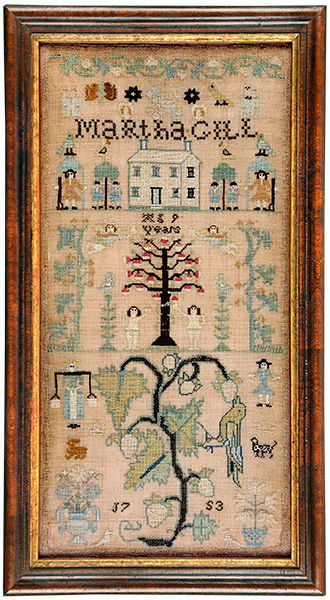 This charming sampler of band form contains no text and comprises numerous images, the most striking being placed in the bottom section. This image we associate stylistically with the 17th century and it may have been taken from an earlier engraving. A bird feasts on the fruit of a strawberry plant whilst precariously balanced grasping at a leaf. Coloured silks on a linen ground. 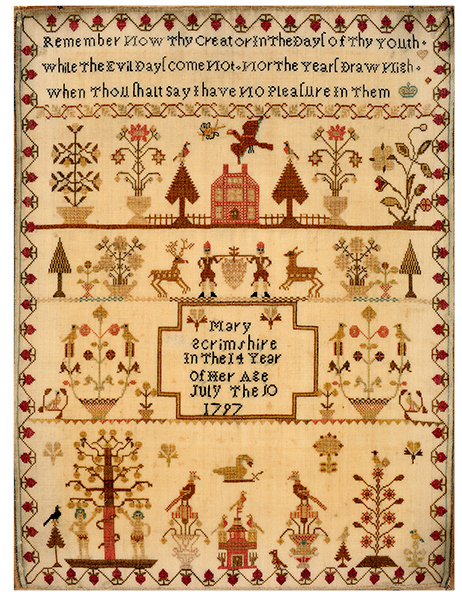 This sampler clearly states at the bottom of the sampler that Alice was taught her needlework skills by her mother. Worked with coloured silks and contained in a period maple frame. Framed Size 21 x 18ins. 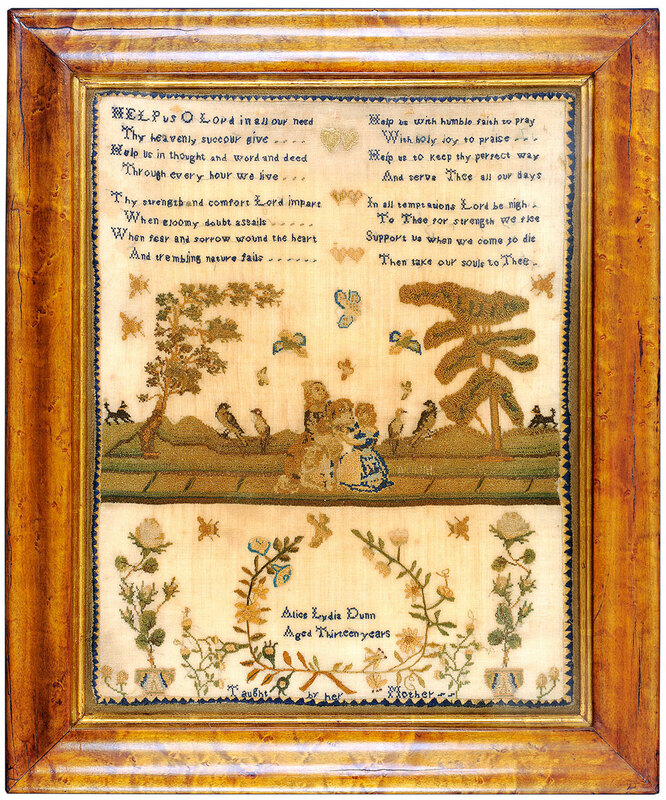 This attractive sampler has an almost three dimensional effect achieved through tight stitching on the individual images worked with coloured silks using cross and petit point. Contained in the original broad mahogany frame. Licensed Victuallers' School. London 1856. 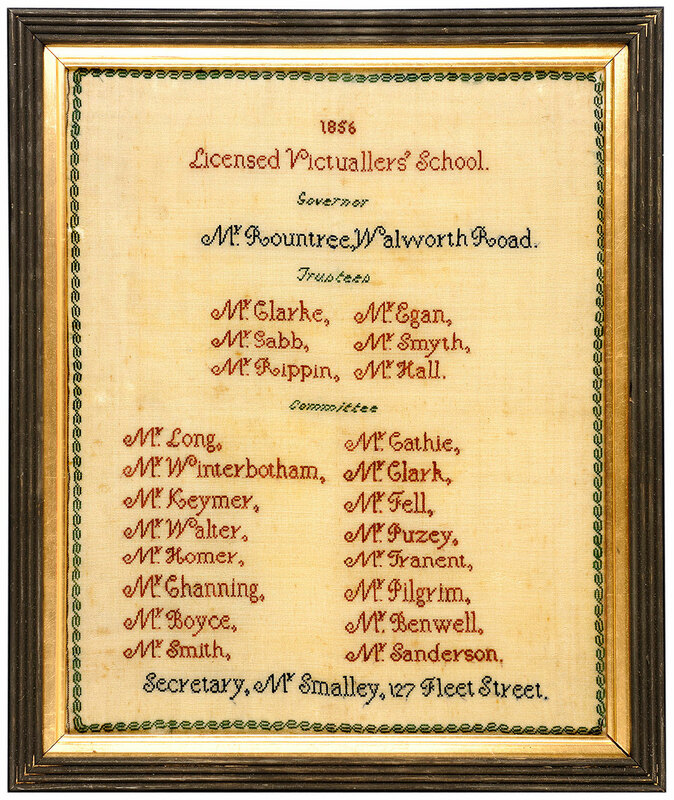 A rare neatly embroidered sampler probably embroidered as a presentation piece on the occasion of the annual election of children to the school which was founded in 1803 for the children of deceased or impoverished publicans. Framed Size. 19 x 16ins. 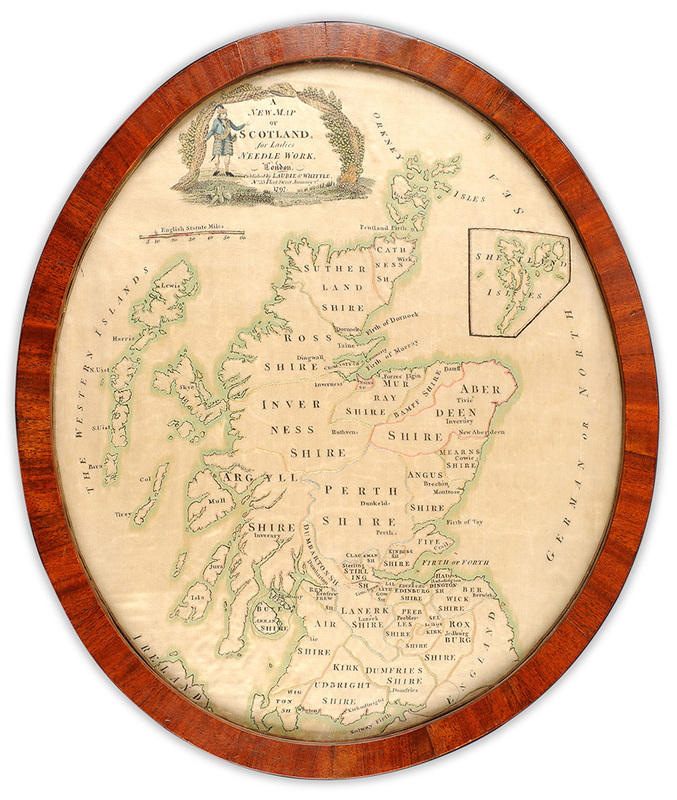 The title of this rare silk map is at the top left hand corner within a cartouch surrounded by greenery and a tartan swag with a highlander in traditional dress. A paper version of this map is in the collection of the National Library of Scotland, whilst another copy is owned by the Royal Scottish Geographical Society. Contained in the original oval mahogany frame. 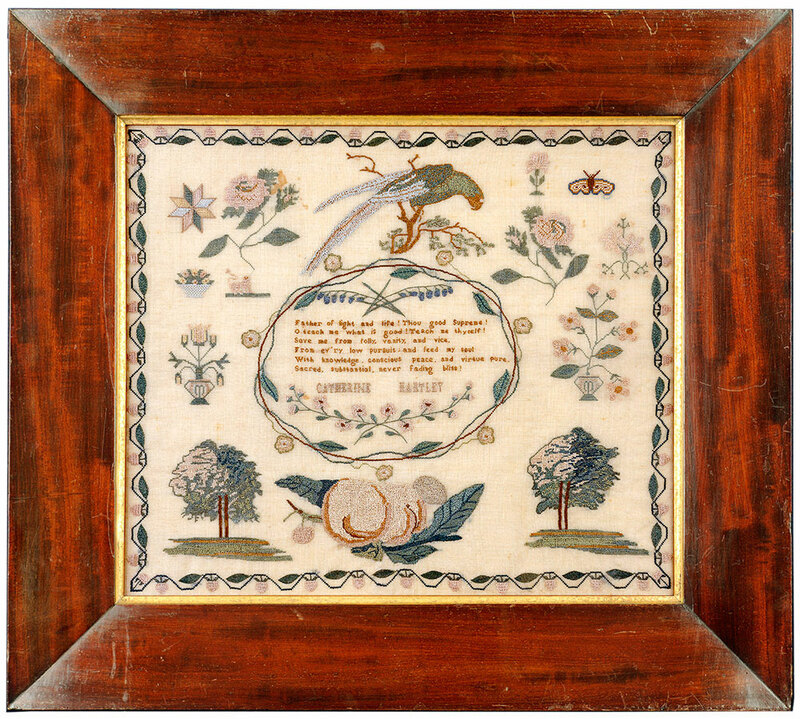 Medallion sampler of landscape form almost certainly by Mary Storr, a scholar at Ackworth School between 1789 and 1791.